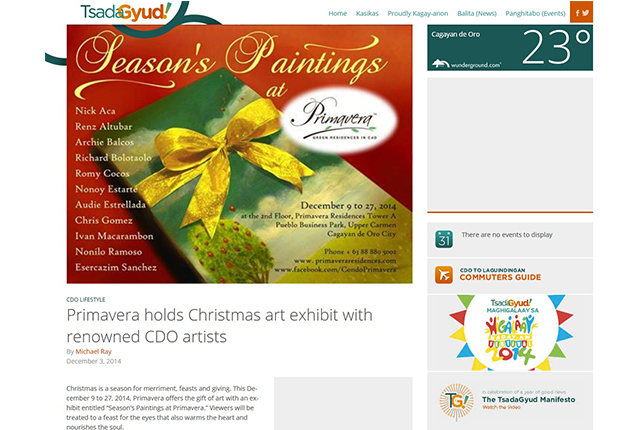 As we enter 2015, Primavera is proud to offer more good news, promos and event opportunities not only for Kagay-anons, but for Filipinos and investors all over the world. 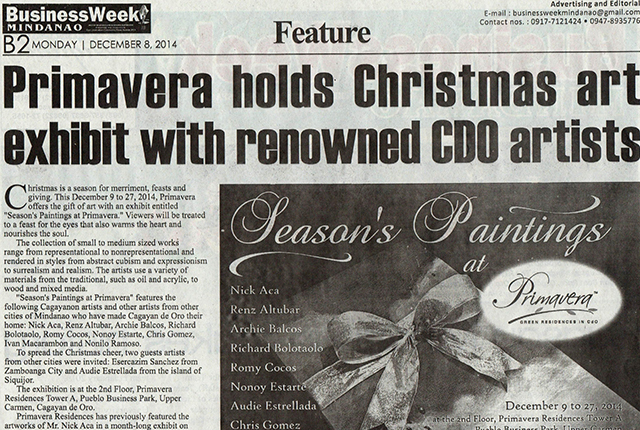 The last month of 2014 has not only paved ways to pursue our advocacies but also offered investment and career opportunities for everyone. 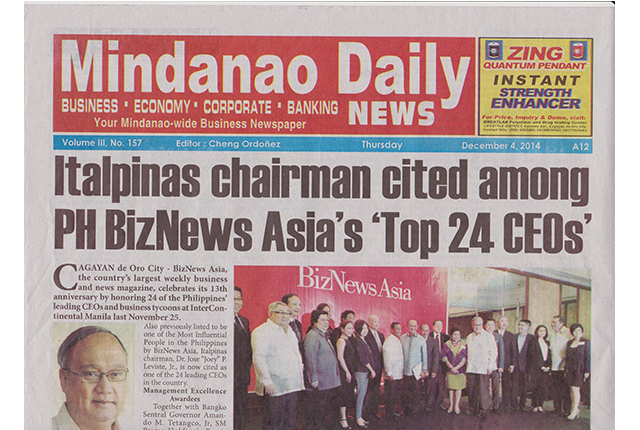 Also received awards that cemented Italpinas’ lead in pioneering sustainable development in Northern Mindanao. 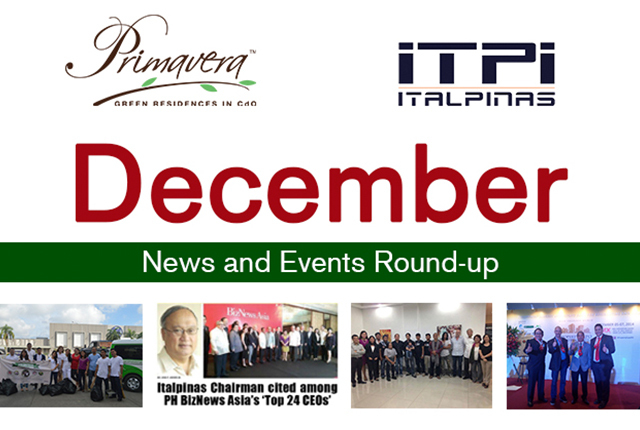 Here is a look at the news and events last December. 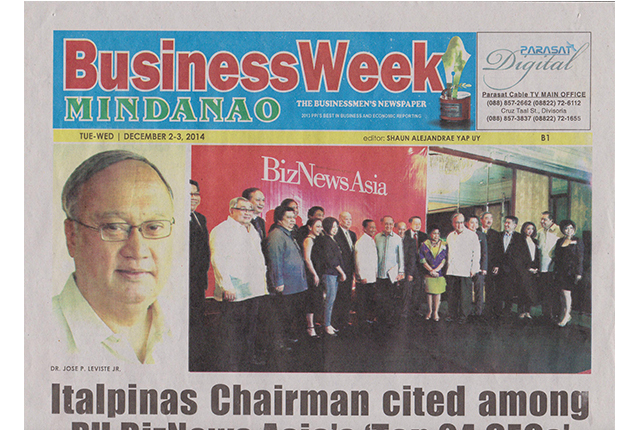 BizNews Asia, the country’s largest weekly business and news magazine, celebrates its 13th anniversary by honoring 24 of the Philippines’ leading CEOs and business tycoons at InterContinental Manila last November 25, 2014. 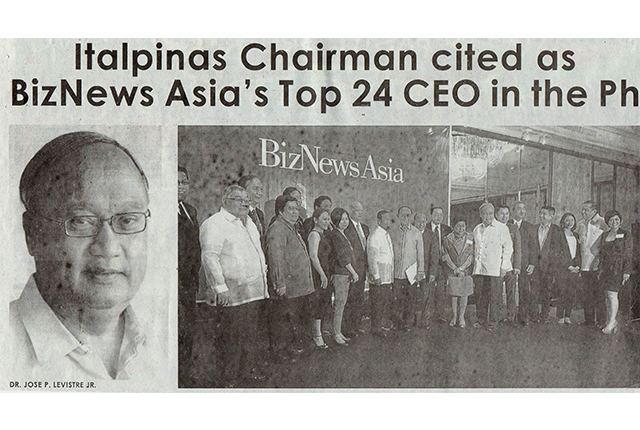 Also previously listed to be one of the Most Influential People in the Philippines by BizNews Asia, Italpinas Chairman, Dr. Jose “Joey” P. Leviste, Jr, is now cited as one of the 24 leading CEOs in the country. 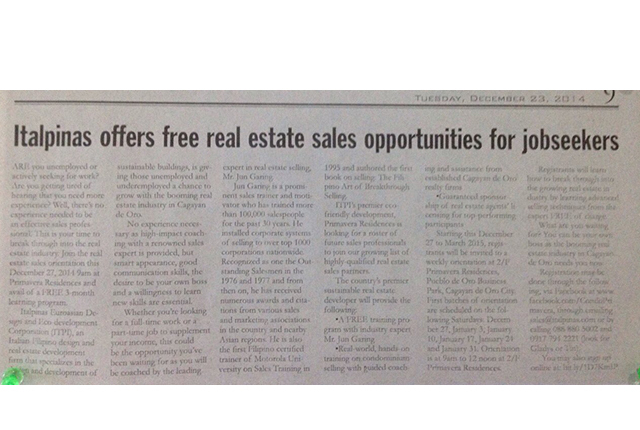 This story appeared in several publications in the city. 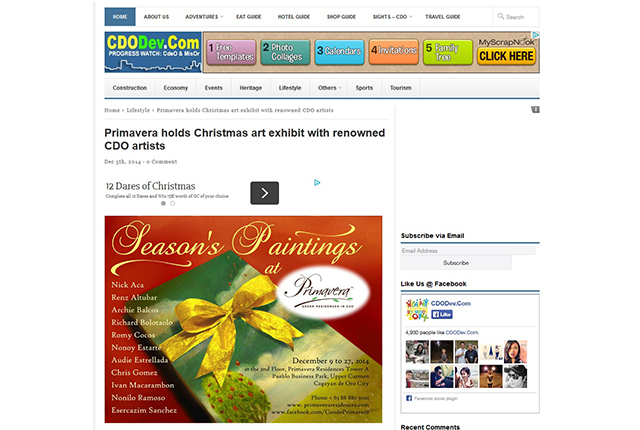 Christmas is a season for merriment, feasts and giving. 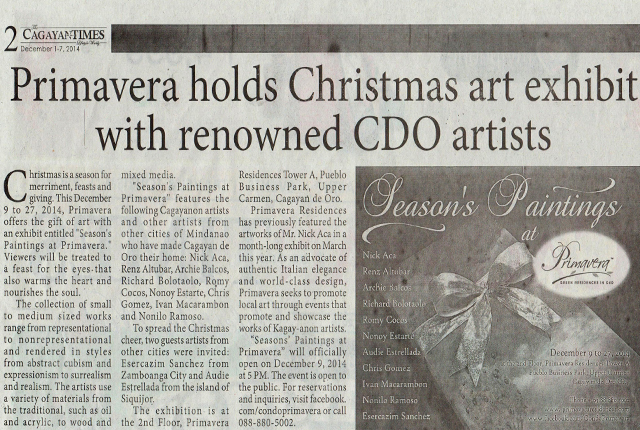 Last December 9 to 27, 2014, Primavera offered the gift of art with an exhibit entitled “Season’s Paintings at Primavera.” Viewers were treated to a feast for the eyes that also warms the heart and nourishes the soul. The collection of small to medium sized works range from representational to nonrepresentational and rendered in styles from abstract cubism and expressionism to surrealism and realism. 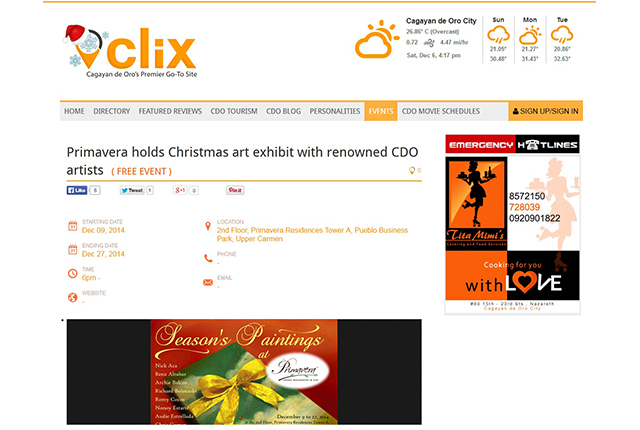 The artists use a variety of materials from the traditional, such as oil and acrylic, to wood and mixed media. 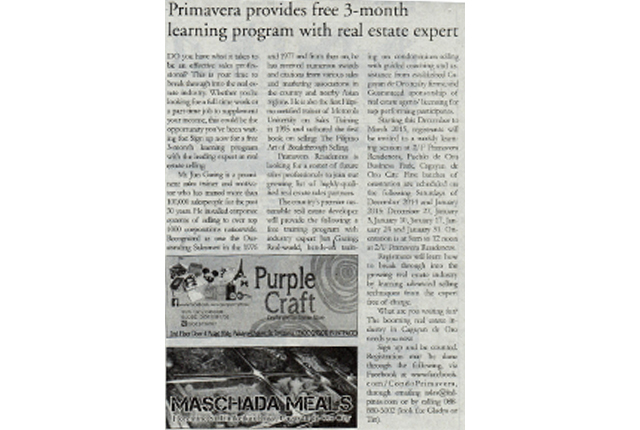 This event was well-covered by media with stories published in different media. 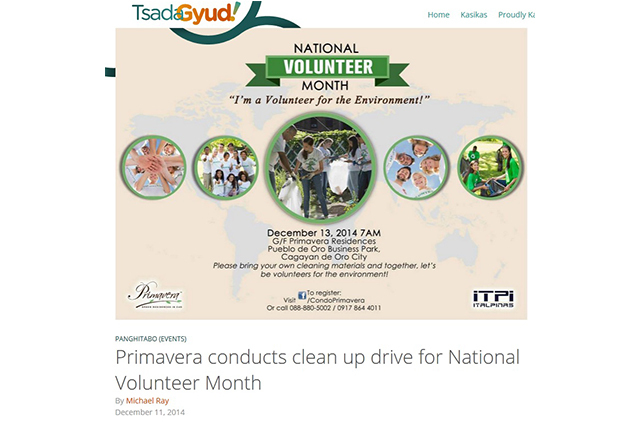 Last December 13, 2014, Primavera Residences personnel have come together in support of the building’s advocacy to a clean and green environment. 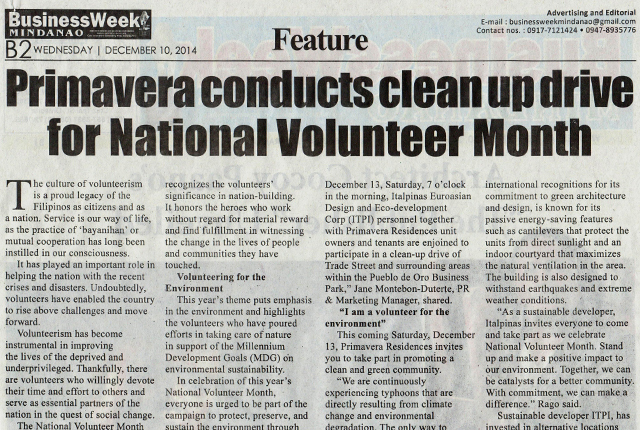 In celebration of the National Volunteer Month with the theme “Volunteering for the Environment”, Primavera Residences took the opportunity to care for the environment by successfully conducting a clean-up drive around Pueblo de Oro Business Park’s Trade Street and areas nearby. Below are some photos and media mentions of this update. 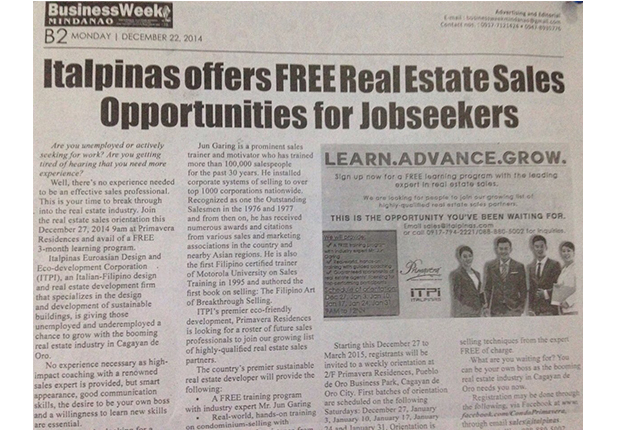 Primavera Residences is looking for a roster of future sales professionals to join our growing list of highly-qualified real estate sales partners with high impact training with a renowned real estate expert, Mr. Jun Garing. The career orientation started last December 2014 and will be followed by series of orientation every Saturday until March 2015. 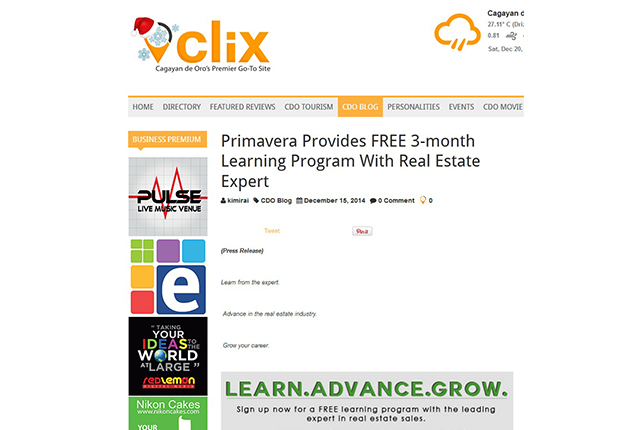 Registrants will be invited to a weekly learning session from 9am to 12nn at 2/F Primavera Residences, Pueblo de Oro Business Park, Cagayan de Oro City. 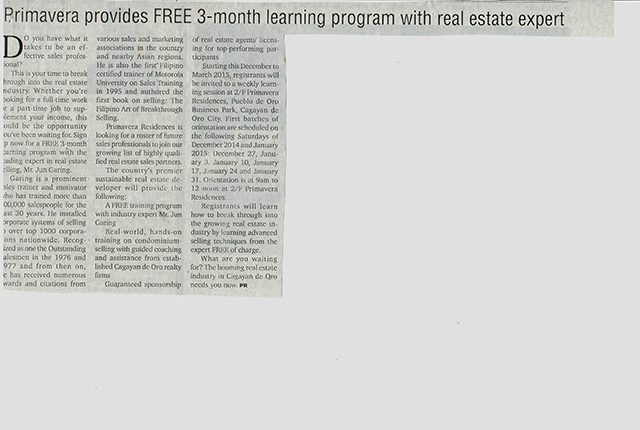 First batches of orientation are scheduled on the following Saturdays of December 2014 and January 2015: December 27, January 3, January 10, January 17, January 24 and January 31. 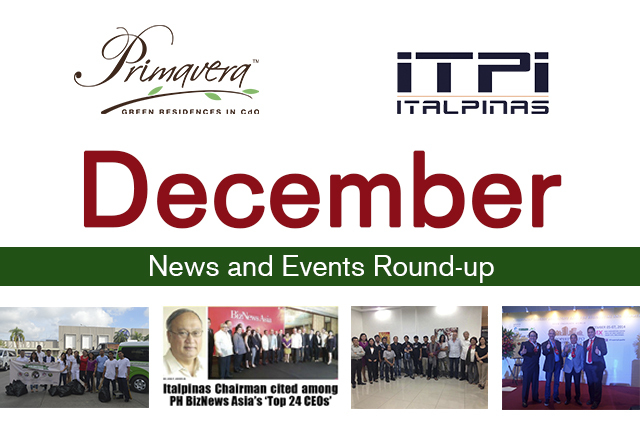 Italpinas Euroasian Design and Eco-development Corporation (ITPI), an Italian-Filipino design and real estate development firm that specializes in the design and development of sustainable buildings, is giving those unemployed and underemployed a chance to grow with the booming real estate industry in Cagayan de Oro. 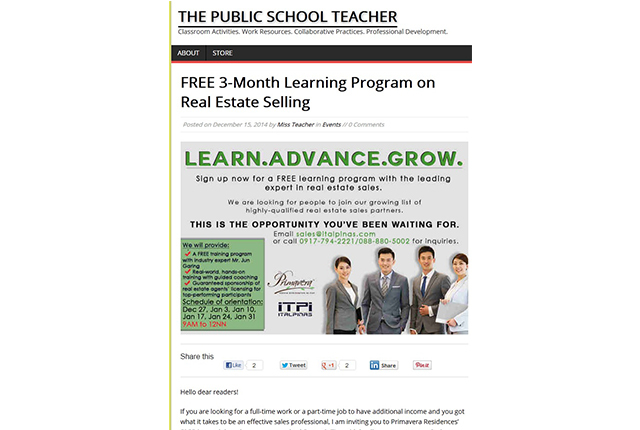 No experience necessary as high-impact coaching with a renowned sales expert is provided, but smart appearance, good communication skills, the desire to be your own boss and a willingness to learn new skills are essential. 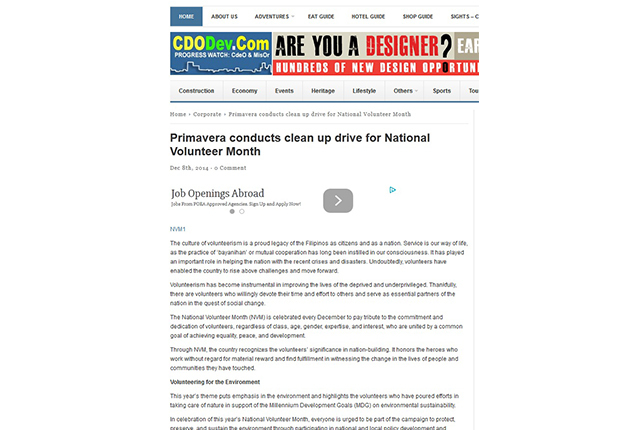 This story appeared in some local papers and blogging sites. 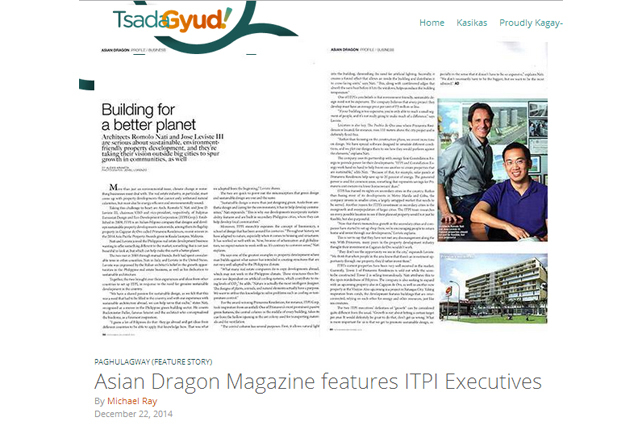 In the spotlight of the November-December 2014 issue of Asian Dragon magazine is a feature story on Italpinas Euroasian Design and Eco-Development Corporation (ITPI), a sustainable real estate developer and the passion behind the executives’ vision for green developments. 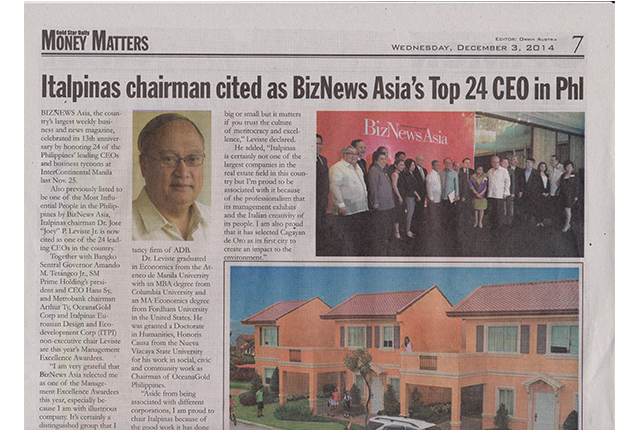 The first bilingual business and lifestyle magazine in the Philippines, Asian Dragon reports on ITPI’s journey into the real estate industry with Chairman/CEO Arch. Romolo V. Nati and President Atty. 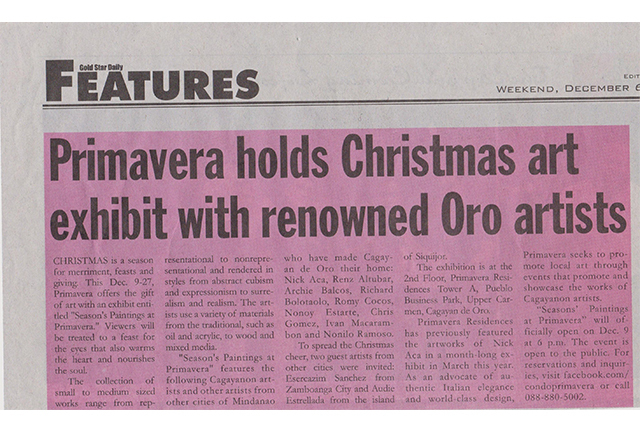 Jojo D. Leviste and an in-depth story of the premier eco-friendly condominium development in Cagayan de Oro, Primavera Residences. This story also appeared in tsadagyud.com. 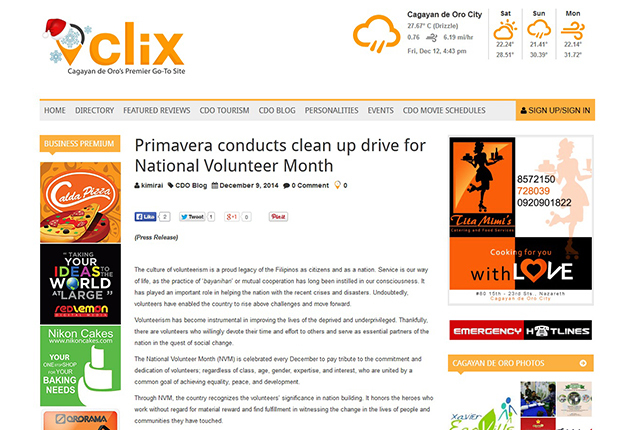 Follow Primavera Residences in Facebook or visit www.primaveraresidences.com to stay posted with news and events from the country’s premier eco-friendly property.